In 1965, Rich Shogren, a tall, lanky, blond graduate student at The University of Arizona, had a vision of a camp for the underprivileged children of Tucson, Arizona; a camp that would be totally run by volunteers drawn from the student body at the University of Arizona. One by one he shared this vision with other UA students. From those coffee cup conversations in the Student Union, Camp Wildcat emerged. Student volunteers recruited, raised funds starting with "two bits for Camp Wildcat" donations, and created publicity in the Wildcat. The first camp was held in 1965 with Rich as Camp Director. Rich Shogren, the casual guy with the warm smile, was always the man behind the camera, the trainer of leaders and because of these traits he did not remain leader of Camp Wildcat for long. 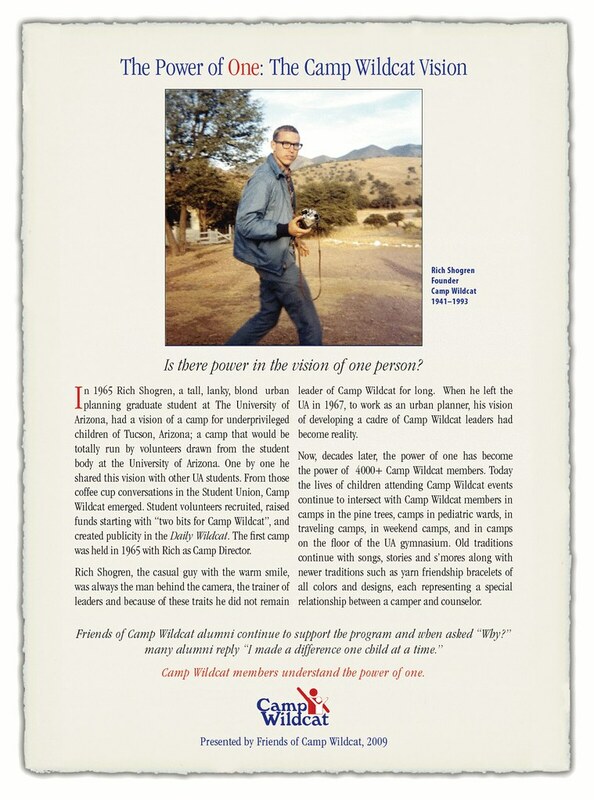 When he left the UA in 1967 his vision of developing a cadre of Camp Wildcat leaders had become reality. Now, many years later, the power of one has become the power of the 4000+ Camp Wildcat members. Today the lives of children attending Camp Wildcat events continue to intersect with Camp Wildcat members in camps in the pine trees, camps in pediatric wards, in traveling camps, in weekend camps, and in camps on the floor of the UA gymnasium. Old traditions continue with songs, stories and s´mores along with newer traditions such as yarn friendship bracelets of all colors and designs, each representing a special relationship between a camper and counselor. Friends of Camp Wildcat alumni continue to support the program and when asked "Why?" many alumni reply "I made a difference one child at a time." Camp Wildcat members understand the power of one. in honor of Camp Wildcat´s visionary founder. Updated by Kevin J. Scott 10 years ago.